After initial priming, each actuation delivers 50 micrograms of Fluticasone Propionate BP in 100 mg of formulation through the nasal adapter. Lutisone (Fluticasone Propionate) is a synthetic, trifluorinated corticosteroid with anti-inflammatory activity. It is an aqueous suspension of microfine Fluticasone Propionate for topical administration to the nasal mucosa by means of a metering, atomizing spray pump. It is necessary to prime the pump before first use or after a period of non-use (1 week or more). Each bottle of Lutisone nasal spray provides 120 metered sprays. After 120 metered sprays, the amount of Fluticasone Propionate delivered per actuation may not be consistent and the unit should be discarded. Lutisone (Fluticasone Propionate) nasal spray is indicated for the management of the nasal symptoms of seasonal and perennial allergic and nonallergic rhinitis in adults and pediatric patients 4 years of age and older. Prevention of recurrence of nasal polyps following surgical removal. Adults & Children over 12 years: 2 sprays in each nostril once a day, preferably in the morning. In some cases 2 sprays into each nostril twice daily, not exceeding 4 sprays. Children under 12 years (4 - 11 Years): 1 spray in each nostril once a day. The maximum total daily dosage should not exceed 4 sprays. 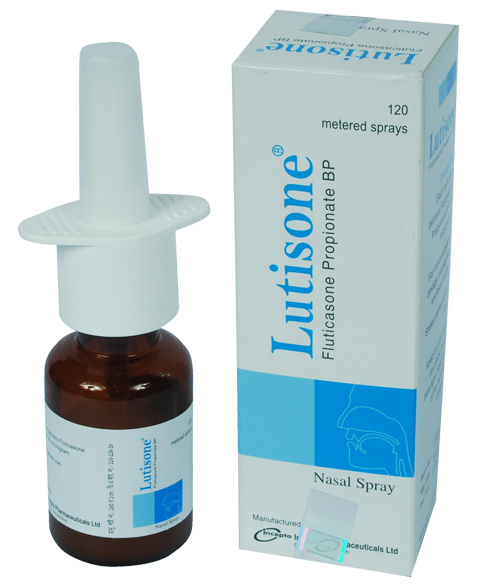 Patients should use Lutisone (Fluticasone Propionate) nasal spray at regular intervals as directed since its effectiveness depends on its regular use. Fluticasone Propionate nasal spray is absorbed less into the rest of the body, therefore fewer side effects are seen. With the nasal spray, drying of the nose and an increase in the incidence of nosebleeds may occur. Rarely, immediate hypersensitivity reactions or contact dermatitis may occur after the administration of Fluticasone Propionate nasal spray. Rare instances of wheezing, nasal septum perforation, cataracts, glaucoma and increased intraocular pressure have been reported following the intranasal application of corticosteroids, including Fluticasone Propionate. Although systemic effects have been minimal with recommended doses of Fluticasone Propionate nasal spray, potential risk increases with larger doses. Therefore, larger than recommended doses of Fluticasone Propionate nasal spray should be avoided. Fluticasone Propionate ointment may cause local cutaneous adverse reactions. If irritation develops, Fluticasone Propionate ointment should be discontinued. Fluticasone Propionate ointment should not be used in the presence of preexisting skin atrophy and should not be used where infection is present at the treatment site. This should not be used in the treatment of rosacea and perioral dermatitis. Pregnancy: There are no adequate and well-controlled studies in pregnant women. Fluticasone Propionate should be used during pregnancy only if the potential benefit justifies the potential risk to the fetus. Lactation: It is not known whether Fluticasone Propionate is excreted in human breast milk. Because other corticosteroids are excreted in human milk, caution should be exercised when Fluticasone Propionate nasal spray is administered to a nursing woman. It is not known whether topical administration of Fluticasone Propionate could result in sufficient systemic absorption to produce detectable quantities in human milk. Because many drugs are excreted in human milk, caution should be exercised when Fluticasone Propionate ointment is administered to a lactating woman. Safety and effectiveness in pediatric patients below 4 years of age have not been established.